Subscribe for Instant New Job Alerts in India. Find the perfect jobs on the go! Submit resume so employers can find you. Latest / Relevant Jobs Alert only! From all over India via Email / SMS / Notification on Mobile App So what are you waiting for, just Go for it! 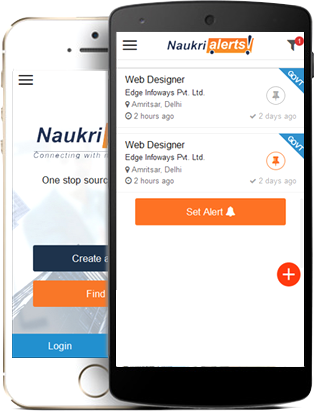 Naukri Alerts is the only website for applying to Govt Jobs and top MNC Jobs all over India. Register Now to benefit from our unlimited fresher focused services! Now search JOBS and create ALERTS on the go with our new Mobile Apps. One stop job search engine where the employers and the job seekers can come together for hiring and placements purposes respectively. This portal displays job listings across the web, including an option to submit the resume and receive alerts for the prospective job sector. Disclaimer : Naukrialerts.com shall not be liable for any payment made to any party other than Edge Infoways Pvt. Ltd.
Get started! Upload resume in one single step. Thank you for uploading your resume. But in order to find the most appropriate jobs we recommend that you proceed below to complete your profile.